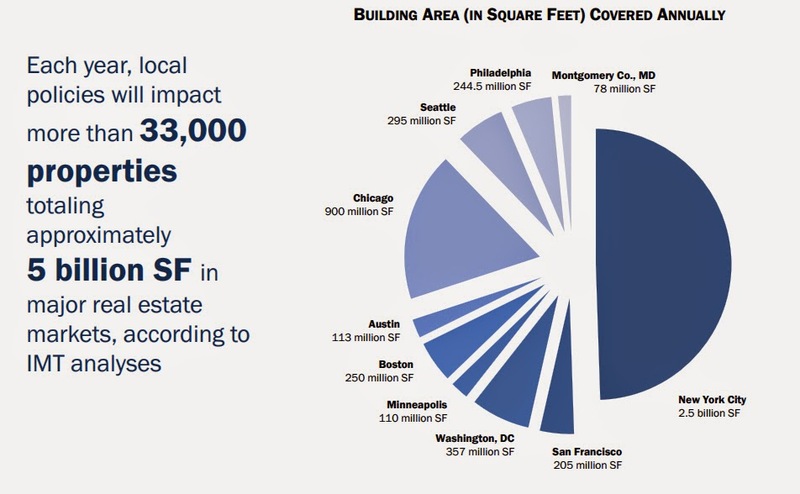 Almost five billion square feet already covered under building benchmarking ordnances in major cities across the country. If you add California and Washington transaction-based requirements, all properties that may need to comply, you get up to about 11 billion feet. AB 1103 - California Assembly Bill 1103 mandates disclosure of a building’s energy usage data and Portfolio Manager benchmark score of the previous year to prospective buyers of a commercial building, to prospective lessees of an entire building, and to lenders financing an entire building. Assemblywoman Lori Saldana authored Assembly Bill 1103, which was approved by the Governor in October 2007. The statute requires electric and gas utilities to maintain energy use data and provide it to nonresidential building owners upon request. Additionally, the statute requires nonresidential building owners or operators to disclose Energy Star Portfolio Manager benchmarking data and ratings for the most recent 12-month period to a prospective buyer, lessee or lender. So then, Assembly Bill 531 was approved in October 2009 as a follow up to AB 1103, which amended the Public Resources Code to allow the California Energy Commission to manage the implementation schedule for AB 1103. Regulations were adopted by the California Energy Commission in October 2013. AB 1103 implementation for buildings, 10,000 square feet and greater, began January 1st, 2014. Building Energy Performance monitoring supports continuous improvement, but AB1103 is really a one-time thing at a transaction and may be too late in the process to provide a lot of benefit to buyers and sellers, A relatively small set of buildings are sold, leased, and re-fied, refinanced in any given year or period of time. So, there’s a much broader market for this than just what is being treated by 1103. AB 1103 allow for energy use estimation to protect real estate transactions so its data accuracy may be questionable. ABS - Automated Benchmarking Service - works with Energy Star’s Portfolio Manager and enables building owners to identify poorly performing buildings and provides baseline data and the means for comparing performance of similar buildings. 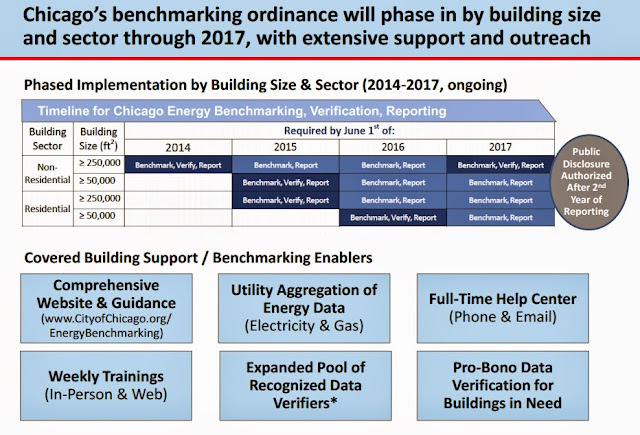 Building owners can enter building data for benchmarking building energy performance. 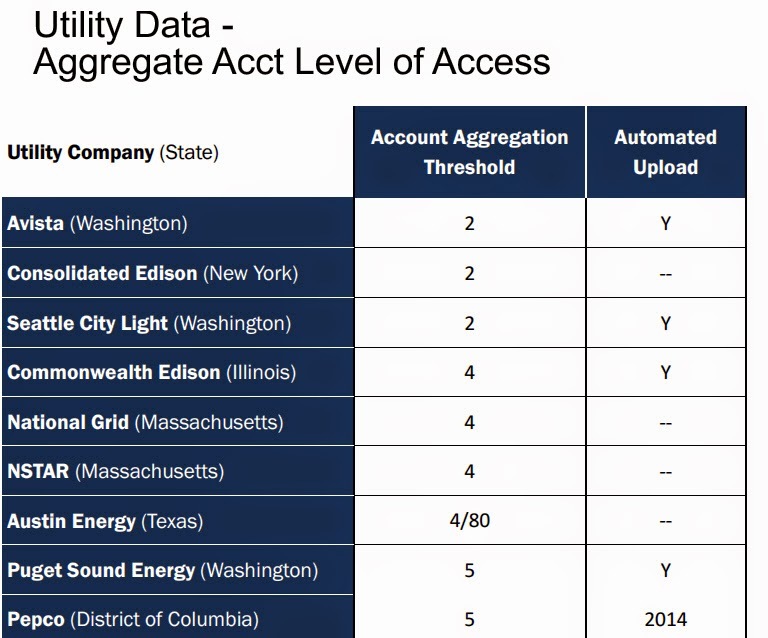 Once this is established, utilities can then upload the last 12 months of usage data and continue monthly uploads without any extra effort by building owners through the ABS. Asset Rating - Assesses the theoretical energy performance of the physical envelope and major systems of a facility under standard conditions, using energy modeling software and diagnostic tests. Under this rating system, a facility’s energy use is estimated and then compared to the projected energy efficiency of a reference building based on observed architectural and building systems characteristics. Unlike operational ratings, asset ratings can provide information about specific equipment or areas of a building that could help improve building energy use. 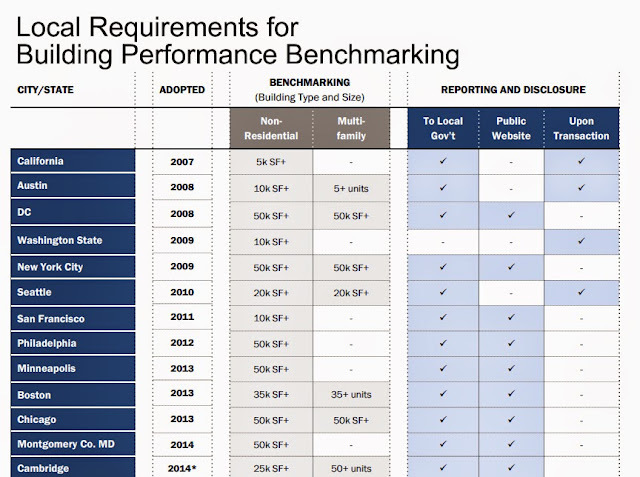 The proposed California Building Energy Asset Rating System (BEARS) tool, which is currently under development, is an example of an asset rating benchmarking tool. Other examples include EPA’s Target finder tool that enables architects and building owners to set energy consumption targets needed to receive an EPA energy performance score during the building design phase. The Home Energy Rating System (HERS) is an example of a residential asset rating tool. bEQ - Building Energy Quotient - An ASHRAE building energy rating program that provides information on a building's energy use. Two separate workbooks, one evaluating As Designed potential and the other assessing In Operation performance, form the foundation of bEQ. bEQ rests on ASHRAE methodologies and standards and the experience of qualified practitioners. 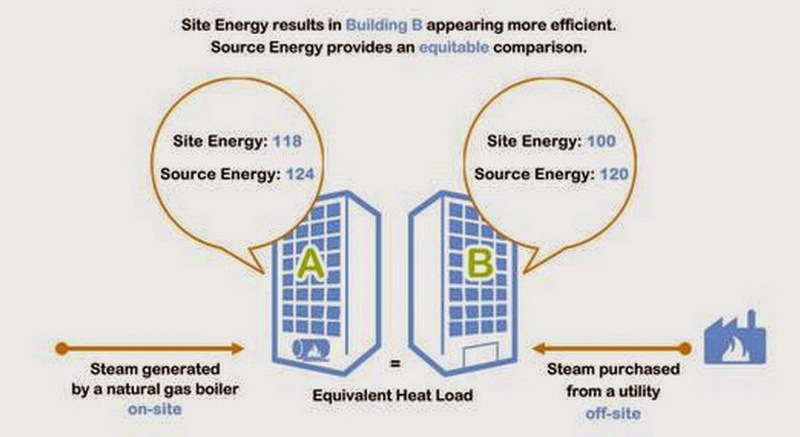 Building Benchmarking - The rating of the relative energy efficiency of a building compared to its peers, and in many cases also includes making this information known to consumers. CBECS - Commercial Buildings Energy Consumption Survey - Conducted about once every four years by the Energy Information Administration (EIA). New CBECS data will be available in late 2015, when EIA releases the results of its 2012 survey. To learn how EPA will use this information, view the May 2014 recorded webinar,Planning for Updates to the 1 to 100 ENERGY STAR Score with 2012 CBECS Data. EUI - Energy Use Intensity - expresses a building’s energy use as a function of its size or other characteristics. 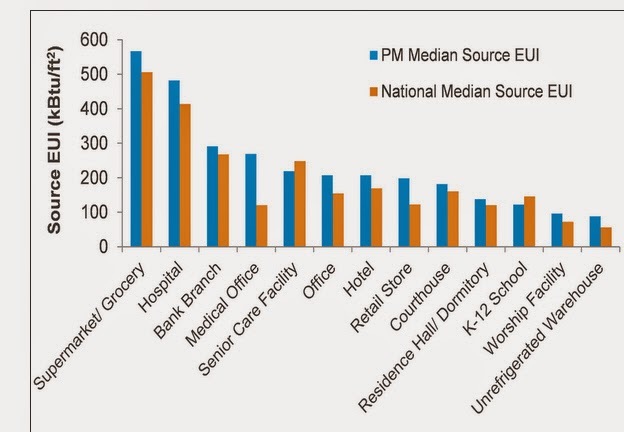 For most property types in Portfolio Manager, the EUI is expressed as energy per square foot per year. It’s calculated by dividing the total energy consumed by the building in one year (measured in kBtu or GJ) by the total gross floor area of the building. EPA has determined that source energy is the most equitable unit of evaluation. Source energy represents the total amount of raw fuel that is required to operate the building. It incorporates all transmission, delivery, and production losses. By taking all energy use into account, the score provides a complete assessment of energy efficiency in a building. Site energy is the amount of heat and electricity consumed by a building as reflected in your utility bills. Looking at site energy can help you understand how the energy use for an individual building has changed over time. Site energy may be delivered to a building in one of two forms: primary or secondary energy. Primary energy is the raw fuel that is burned to create heat and electricity, such as natural gas or fuel oil used in onsite generation.Secondary energy is the energy product (heat or electricity) created from a raw fuel, such as electricity purchased from the grid or heat received from a district steam system. 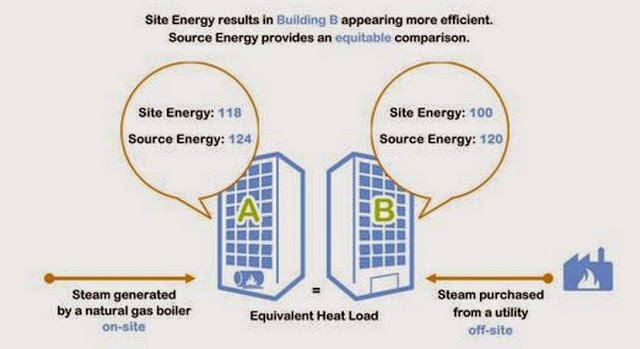 A unit of primary and a unit of secondary energy consumed at the site are not directly comparable because one represents a raw fuel while the other represents a converted fuel. Therefore, to assess the relative efficiencies of buildings with varying proportions of primary and secondary energy consumption, it is necessary to convert these two types of energy into equivalent units of raw fuel consumed to generate that one unit of energy consumed on-site. To achieve this equivalency, EPA uses source energy. When primary energy is consumed on site, the conversion to source energy must account for losses that are incurred in the storage, transport, and delivery of fuel to the building. When secondary energy is consumed on site, the conversion must account for losses incurred in the production, transmission, and delivery to the site. The factors used to restate primary and secondary energy in terms of the total equivalent source energy units are called the source-site ratios. Normalization - To make comparisons meaningful, benchmarking tools normalize a number of critical factors that drive energy consumption. These factors include but are not limited to local climate conditions, occupancy, hours of operation, age of structures, plug loads and others. Operational Ratings - Use a combination of basic information about a building and 12 months of energy consumption data to determine a building’s EUI at a particular point in time and, where available, to rate the building’s energy efficiency against similar types of buildings in a state or nation. Operational rating systems provide an indication of actual energy use and account for factors such as hours of use, occupancy, plug loads, maintenance of equipment and other behavioral factors. Operational rating tools typically do not provide enough information to help identify specific improvements needed in a particular building. However, they can help those responsible for multiple buildings to pinpoint specific buildings in a portfolio of buildings for further investigation. Operational tools typically do not require a site visit, which is normally required for asset rating tools. 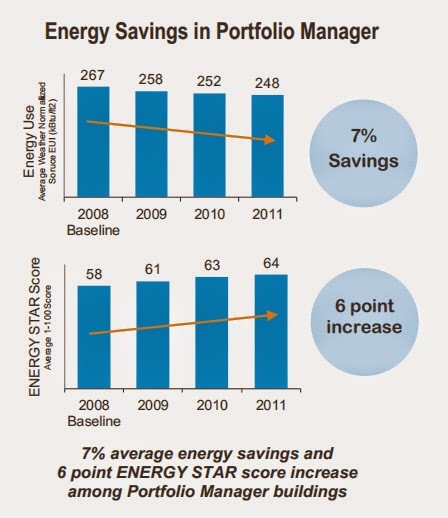 ENERGY STAR Portfolio Manager is an operational rating benchmarking tool. Another example of an operational benchmarking tool is ASHRAE’s Building Energy Quotient (BEQ) tool. Portfolio Manager - Energy Star Portfolio Manager - An online interactive energy management tool created by the EPA that allows users to track and assess energy and water consumption of their commercial building or portfolio of buildings. 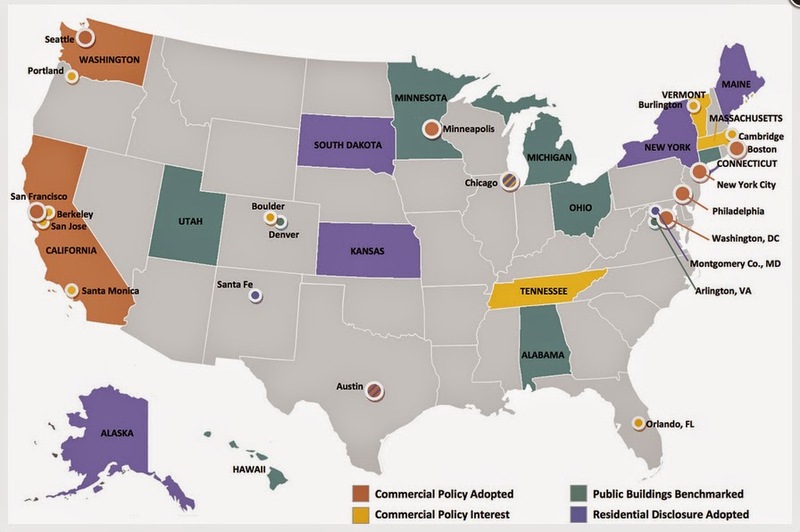 All of the places that have adopted building energy peformance are leveraging Portfolio Manager. It’s under- appreciated how much this has help that it’s standard acr free, a lot of the market knows how to use it already, things that have been critical to the success. If you look at Europe, where this is required by the commission, basically energy rating for all their buildings, in the 26 or 28 member states, each one of them has different schemes, different rating schemes, different requirements, different tools.So, what was intended to bring some standardization across the European markets has almost totally failed. The tool helps facility owners and operators to identify under-performing buildings relative to peer buildings, prioritize buildings for energy efficiency investment, track energy improvements, and obtain EPA recognition for superior energy performance of buildings. To help facility owners and operators assess the energy performance of buildings, Portfolio Manager rates qualified buildings on a scale of 1 to 100. A score of 75 means that the energy performance of a user’s building is better than 75 percent of all similar buildings nationwide. Buildings that are unable to receive a score can obtain a measure of energy use intensity, or EUI. Used to track more than 325,000 buildings, representing more than 30 billion square feet of commercial and institutional building space in the U.S. Web Services - Some utilities use Portfolio Manager Web Services to take it to scale and allow their customers to request the download of their energy data into their Portfolio Manager accounts. The average commercial building wastes 30 percent of the energy it consumes. That means that if you haven’t done anything to save energy, chances are, you’ll find many opportunities to improve. And there’s more good news: You don’t have to spend money to save energy. Start with no- and low-cost improvements, and then use savings to pay for more extensive upgrades. The first step in assessing your building’s energy use is creating an ENERGY STAR® Portfolio Manager account. Input utility specific required data at the Automated Benchmarking Service console. Log into ENERGY STAR® Portfolio Manager the next business day for meter data and initial benchmarking results. Reduce energy and carbon - by strengthening market demand for energy efficiency, building awareness with building owners and operators about opportunities to improve efficiency. In 2012, an EPA analysis of 35,000 benchmarked buildings around the U.S. found that benchmarked buildings experienced, on average, 2.4% energy savings annually. Buildings that benchmarked for three years running saw an average energy savings of 7% during that same period. A 2012 report by the Georgia Tech Ivan Allen College School of Public Policy found that energy benchmarking in commercial properties could reduce national energy consumption by 5.6 percent in 2035. Another 2012 report, commissioned by the California Public Utilities Commission, found that benchmarking was highly correlated with building energy improvements and management actions, and was a strong catalyst for customer participation in utility clean energy rebate and incentive programs. Continuous Improvement - According to EPA’s DataTrends Series, buildings that consistently benchmark energy performance realize average energy savings of 2.4% annually. Identification and Improvement of Poorly Performing Buildings - Accord to the above 2012 EPA study, buildings that start with lower ENERGY STAR scores and higher energy use achieve the greatest savings. 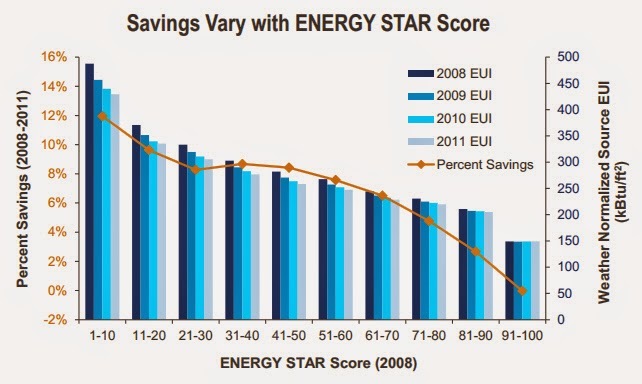 In fact, buildings starting with below average energy efficiency in 2008 (i.e., score under 50) saved twice as much energy as those starting above average. If all buildings in the U.S. followed a similar trend, over 18 million metric tons of carbon dioxide equivalents could be saved each year. Make Government Smarter - Improved Policy Making - Enable policymakers to craft data-driven EE policy for buildings. Everybody can agree nobody wants governments crafting policy in areas that they know very little about. The information that is now being reported to governments is going to help them design policies that are much smarter, respond better to conditions and, hopefully, allow governments to do more efficiency with fewer taxpayer dollars. Expand Energy Transparency - Indirect Benefit ,but in some cities that the goal is transparency in and of itself, which is different. If you think about it as the goal of like a nutritional label on food, the value there is simply to convey information, and it’s not tied to dependent outcomes, such as decline in the obesity rate throughout the country. Linkage with Rebate Programs - The CPUC commissioned a study a couple of years ago that found a correlation between benchmarking and improved enrollment rates in the utility incentive and rebate programs, which we think is potentially a very consequential finding. A building owner will be motivated to make investments before a future sale or lease, making their building more competitive. A new tenant can request changes that will improve the efficiency of a leased space as part of negotiated tenant improvements. The new purchaser of a building can choose to renovate it, including making improvements that will increase energy performance. Data Availability - Benchmarking the energy performance of a building requires utility data on energy use; however, that data is often difficult for owners and managers to obtain. Separate meters - Building owners cannot access energy meters in buildings where tenants are billed directly for energy without authorization from those tenants. Manual data collection - Securing authorization from tenants to release the data, or collecting it monthly from individual tenants, can be time-intensive and procedurally difficult. Utility data policies - Many utilities have rigorous rules and privacy policies governing the direct release of customer energy data to third parties. Data Mobility - the benchmarking data that is being disclosed is not yet very mobile and it’s not yet very visible. Cities, and states in some cases, are setting up websites. Privacy Requirements - California's laws and regulations regarding the privacy of energy use data constrain benchmarking of commercial buildings in the state. In an attempt to comply with current laws and regulations concerning privacy, IOUs have required owners of multi-tenant buildings to obtain legal authorization from each tenant with a meter in the building in order to use the utility ABSs with Portfolio Manager. 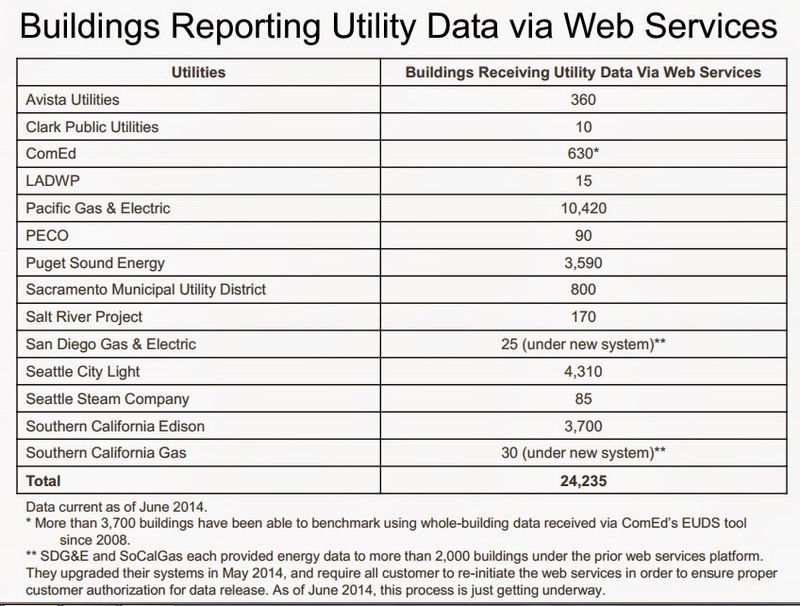 On May 5, 2014, the California Public Utility Commission (CPUC) issued D0405016, - "The Decision Adopting Rules to Provide Access to Energy Usage and Usage Related Data While Protecting Privacy of Personal Data" This decision adopts rules that provide access to energy usage and usage-related data to local government entities, researchers, and state and federal agencies when such access is consistent with state law and CPUC procedures that protect the privacy of consumer data. directs the provision of data containing “covered information,” including personal information, to the University of California and other nonprofit educational institutions for research purposes as long as the institutions requesting data conform to the processes and requirements set forth in this decision. Directs the utilities to post, starting 180 days from or the issuance of this decision, and on a quarterly basis thereafter, the total monthly sum and average of customer electricity and natural gas usage by zip code (when the zip code meets specified aggregation standards) and by customer class, as well as the number of customers in the zip code by customer class (i.e. residential, commercial, industrial, and agriculture). Directs utilities to make available to local governments yearly, quarterly, and monthly usage and usage-related data by data request when the data request meets certain requirements on aggregation and anonymization and restrictions on use and disclosure. Local government may request data by census block group or other grouping that it finds helpful. Directs utilities, after informing the Commission, to provide energy data to State and federal government entities that need data to fulfill statutory obligations and request such data pursuant to this decision. The provision of energy usage data pertaining to low-income participants in EE programs to the California Department of Community Services and Development is approved. Creates a process whereby entities can request energy usage and usage-related data from utilities and receive action on the request and resolution of disputes over access to data. Directs the formation of an Energy Data Access Committee to advise the utilities on process improvements and best practices related to data access and help mediate disagreements between the utilities and data requesters. This decision also considers 12 "use cases" that constituted specific requests for energy consumption data and answers each request. Plug Loads - The energy consumption of non-regulated loads, such as computers and other plug loads, is rising, threatening to negate the gains made by energy codes. With that in mind, many believe that it is necessary for energy codes to evolve toward performance requirements. If they do so, builders and designers can maintain flexibility while meeting more stringent energy efficiency targets. Awareness by tenants is very low. Ideally, the businesses and the residents in 2 multi-family buildings and commercial buildings are using this information as part of the decision making process. We’re not really seeing that, yet. Confusing Metrics - Energy metrics can be a very tough thing to convey well to markets. The EPA metrics, including the 1 to 100 score are very good, but as these policies mature and as we expect them to be impacting broader segments of the market we need to be thinking about the best way to communicate the value. Don't Over Regulate Smaller Buildings - Cities have really coalesced around a building size threshold that runs 25,000 square feet to 50,000 feet, so the focus is on medium and larger buildings. What the cities have basically come to is that they want to start with larger buildings, understanding that these are the owners and operators that are more savvy and in a better position to comply before moving further down the market into smaller buildings with much different ownership and management profiles. Help Centers - Set up benchmarking compliance help centers, with actual people there, where the market could call in and ask questions about the regulation, could get help getting started benchmarking. Integrate into Existing Business Processes - Get it into existing information databases that the industry uses, such as CoStar. SMART exemptions, opting people out of the market disclosure if they have poor scores, in return for enrolling in programs that will help them get to savings, in exchange for enrolling in utility incentive programs. Using benchmarking disclosure policies to channel building owners that need help with efficiency into programs that can give them that help. 5 And that’s very different than how these policies have been set up today. Cross Fertilization - There are ways to tie in the help centers, help get incentives in front of these owners, help get them into other programs, help put financing programs that the cities and states have crafted in front of them, like PACE and On-Bill. Managing Big Data - The most disruptive change from these laws I think will be the data that is being generated, and given to the market, and to governments. In New York, two and a half billion feet is covered. In Chicago, a billion feet of space is covered.This is information at the building level on a scale that the country just has not seen before. Integrate Energy Codes & Energy Performance - Eventually, the line between energy codes, which regulate physical attributes, and building performance policies, which help regulate operating characteristics, may have to be eliminated. This could lead to the development of a true “energy performance” code, which would consider not just building design and construction quality but how well the completed and occupied building actually performs. About half of these adoptions have occurred within the last 24 months; the trend is accelerating. Importantly, after 2010 there’s been no adoption that has been transacted-based. So, you’re really seeing a shift and a move into public disclosure, where the market reports information to the city, or the country, or the state and then that gets posted on a public website. New York City Local Law 84, part of the Greener, Greater Buildings Plan, requires all privately-owned properties with individual buildings more than 50,000 square feet (sq ft) and properties with multiple buildings with a combined gross floor area more than 100,000 sq ft to annually measure and submit their energy and water use data to the City. 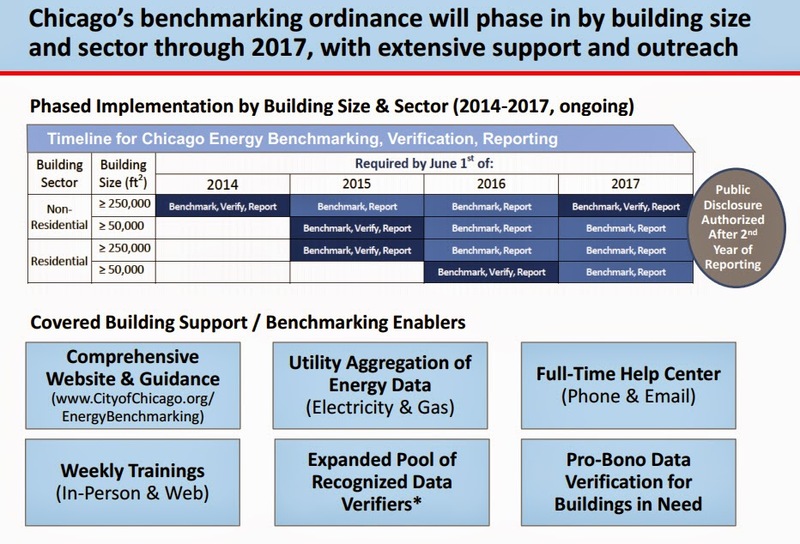 The entirety of the Greener Greater Buildings Plan, which New York City passed, which it’s disclosure, plus audits, and retro-commissioning, and other measures. 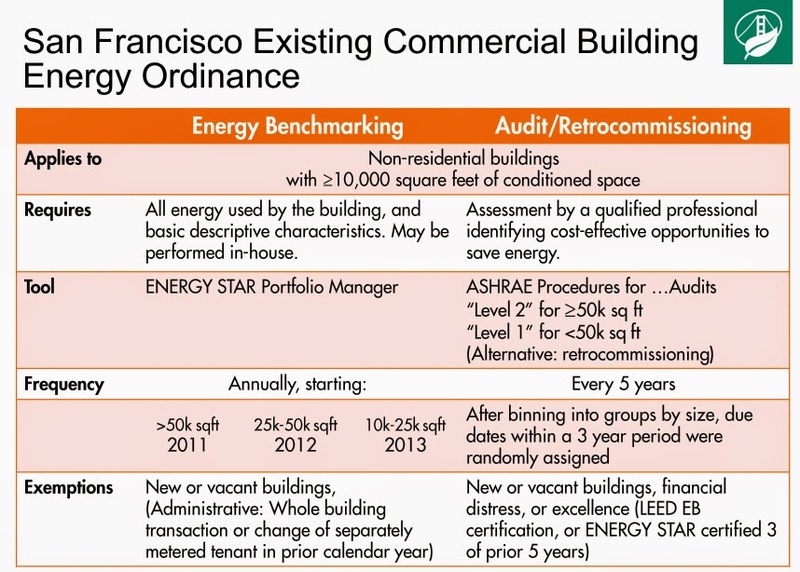 San Francisco - Ordinance requiring owners of commercial buildings of at least 10,000 square feet to conduct an energy audit every five years and benchmark the energy performance annually. Austin, Texas is the only locality that has a single-family audit requirement tied to the time of sale. This is for single-family homes. It has been in effect for a couple of years, now. They also have a mandatory upgrade requirement for multi-family buildings of five units or more, if the multi-family building uses significantly more energy than the average multi-family building in the Austin Energy service territory. With DATA’s support, the National Association of Regulatory Utility Commissioners (NARUC) adopted a resolution in 2011 calling on state regulators to facilitate better access for building owners to whole-building energy consumption data. ICP - Investor Confidence Project of the Environmental Defense Fund (EDF) - Defines a clear road-map from retrofit opportunity to reliable Investor Ready Energy Efficiency™. With a suite of Commercial and Multifamily Energy Performance Protocols in place, ICP reduces transaction costs by assembling existing standards and practices into a consistent and transparent process that promotes an efficient market, while increasing confidence in energy efficiency as a demand-side resource and resulting cash flows for investors and building owners. IMT - The Institute for Market Transformation, Washington, DC - Nonprofit organization promoting energy efficiency, green building and environmental protection in the United States and abroad. IMT’s work addresses market failures that inhibit investment in energy efficiency and sustainability in the building sector. Acts as an advisor to city, states and the Federal government on energy efficiency policy programs, codes. Has staff in about ten cities around the country, working within city government helping them craft and implement energy-efficiency programs. Most of that is through a new project called the City Energy Project, which is joint with the Natural Resources Defense Council. BuildingRating.org - An international exchange for information on building rating disclosure policies and programs.